Have your car detailed while you travel! We’ve partnered with partnered with Fleet Management Services. Fleet Management is a certified ASE maintenance facility qualified to service all domestic and foreign vehicle makes with 4 staff mechanics and a body shop servicing over 40 local company fleets for the last 10 years. These services are available with a minimum 48 hour parking transaction. 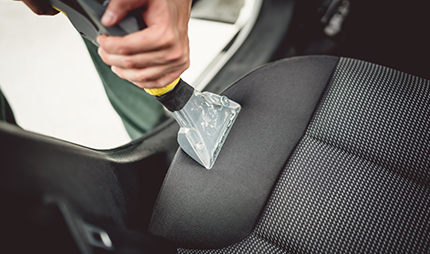 Make a reservation for parking online After choosing your check-in and check-out date and time, simply choose your desired auto detailing services. When you arrive at our lot, park in the designated Reserved parking spots in the Covered or Uncovered areas. The shuttle driver will place a lock box on your driver window for your keys. Simply park in the designated parking for Auto Services When you arrive, you’ll tell the shuttle driver which services you want and they will place a lock box on your driver window for your keys. When you return, you’ll pay for your services at the cashier window. Have questions about our oil change & tire rotation repair services? We’re proud to offer you car care services while you travel!